It’s not just a simple quote from Kelsey Miles. The Ohio-born woman is a beauty, inside and out, and Wisconsin is fortunate she now considers Madison her home. Kelsey’s story, of the way she found music while in the midst of being focused on something very different, may amaze you. But it is also why she believe she can help music, help you, too. Kelsey will be releasing a few new, extended songs, during the next two months. But she has much more planned. And we can’t wait to see it happen. Maximum Ink: Your decision to create your own music just started a few years ago which is amazing to me! 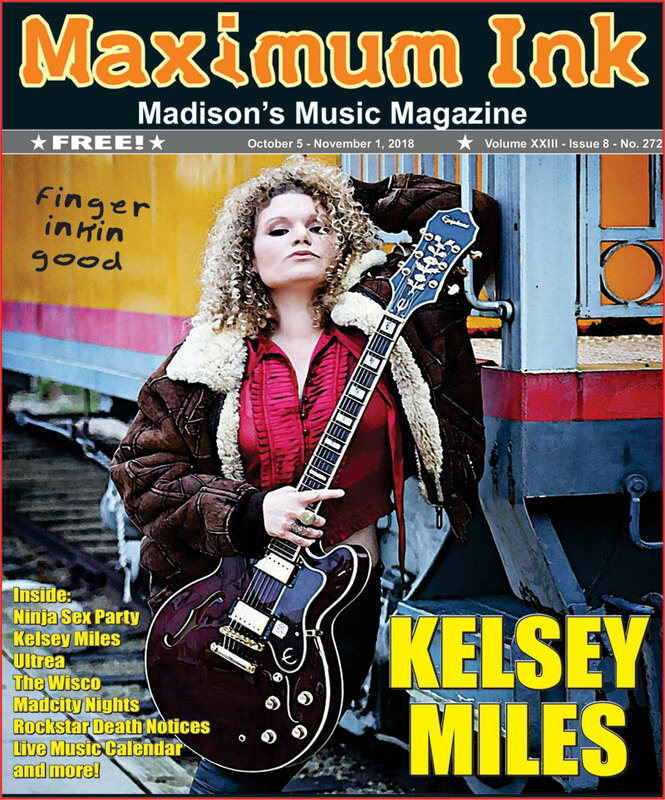 Kelsey Miles: I’ve always liked to sing. I would make up little songs and such when I was younger, but it wasn’t until I moved to Wisconsin in 2013, I actually got involved with music. I picked up the guitar because I was going through a really rough time in my life. A friend of mine knew I liked to sing, and thought I might like learning how to play guitar, so she suggested I borrow hers and take a class. After some group lessons, we had learned a couple of chords. and I immediately began to write songs. It was a healing process for me. For the first time in my life, I had an outlet in which I could be my true self. I decided to be bold and play at open mics and open jams. I was nervous, but I was curious about playing out. Luckily, the hosts were very welcoming and invited me back. I was content with playing at home, but I had a few people tell me how much they liked my songs and that it meant something to them. They would then share their story with me and tell me what my song meant to them. MI: You also completed your doctorate studies recently. How are you balancing all of these demands? KM: Completing my doctorate while I was just starting in music was far from easy and didn’t really work well together. I studied organic chemistry at UW-Madison, and was blessed to have the opportunity to study at one of the best chemistry schools in the nation, not to mention my advisor is phenomenal at his craft. And when I first arrived in Wisconsin, I was working 80 hours a week to cope with the struggles in my personal life. But, when music found me, I had to work even harder to find a way to balance my two lives. Every morning I would play my guitar, and then I would put my hair back and my lab coat on. But as soon as I got home, I’d either be working on new songs or going to a jam or a show or rehearsing with other people. It was difficult to balance. I had no idea what music was going to be in my life, I just knew I HAD to play. There was a point I was starting to fall behind in some of my research in grad school, because of the expectations I had also set with my 80 hours a week, there. I guess everything usually works out, because I finished in August 2017, and have a prolific music career underway, too. MI: Where are you from, and what brought you to Madison? KM: I’m originally from Greenville, Ohio. I was getting my PhD at The Ohio State University and was in my third year, but my advisor did not get tenure which essentially means they are fired, and any graduate student working for them needs to adjust their course. I had been accepted to UW-Madison for grad school in 2010, but went to OSU for personal reasons. Luckily, UW-Madison re-accepted me, and I was able to start August 2013. I left OSU with my masters, and was able to complete my PhD at UW-Madison in a little under four years. After I finished last summer, I decided to stick around because I had built a network in the music community. I also love cheese curds. MI: You have some new songs you are working on, and the first one is coming out in October? KM: Yes! I’ll be releasing my blues tune “Show Me,” Thursday, October 11. I wrote the song—music and lyrics—and brought my band into the studio to record it. I really enjoy time in the studio. It allows you to examine your music under a microscope and really pick it apart and get it right. As a scientist, this part is really fun! MI: You have already accomplished so much with both of your careers! What about playing music keeps you wanting to do it? KM: My biggest accomplishment in music is making at least one person in the crowd feel something when I play or sing. I’m fortunate this happens at nearly every show—someone usually comes up and will make a point to tell me that this or that song I played meant something to them and they could feel the emotion. When music moves you, you feel more connected to the world. It’s a beautiful thing and it’s why I am doing what I do. MI: Are you starting to set more, new goals for yourself? KM: I LOVE the process. I LOVE the grind. I have some really big goals, but it’s the journey that I love the most. In fact, if I ever reach my goals, I’ll know they weren’t big enough and I’ll need to set more new ones (laughs). My goals in the near future through the end of 2018, include 2 singles, a music video, and recording my first full EP “Show Me,” the blues tune being released this month. Then I’ll release my blues rock tune “Blue Flame,” in November. My band is in the studio now to support all of it! MI: And there’s Roadie! I first met her when you visited us at the 94.9 WOLX studio. How is she actually part of your road crew now? KM: I have a traveling cat, and her name is Roadie. I met her at a gig at a farm called Together Farms in Mondovi, Wisconsin. I was playing at the venue for their burger night and they wanted to introduce me to their kittens who were looking for homes. I reluctantly said yes, I’m really more of a dog person, but I met Roadie and knew right away she was different. I’m aware I sound like a crazy cat lady, but she is the best! I started taking her out to gigs with me when she was only 9-weeks old. People can’t believe I have a cat on stage with me. Their reactions are priceless! I’ve harnessed trained her, and she typically sleeps in her cat tree or watches me play during my gig. She’s even been invited for some of my indoor gigs. My setup time takes a little longer now, but we have a good process we go through so she’s calm and feels safe at my gigs. The best part about Roadie is when I have to travel for a gig - she is a great road companion and a great buddy. Yep, I do sound like a crazy cat lady, and I’m proud of it. MI: Roadie, the cat, may be the thing that surprises people about you. Is there anything else? KM: This is my natural hair. Feel free to message me if you want to know how I style it. Hint: It’s super easy. Also, I’ve also now taught my cat, Roadie, to sit and be calm when I play really loud music. KM: November 10th with the full band for the Warrior Songs Album 2 release. I wrote a song based on female veteran testimonies. It was a really cool experience and I’m honored to be part of it! And November 28th solo show at the Majestic opening for Dylan Schneider and every Thursday evening I host an open jam called Music Miles at Tricia’s Country Corners from 7-10pm; full backline provided.